Campbell, Mary (May), died November 7th 2018 peacefully. Beloved wife of Bertie Campbell, mother of Robert and Ian, mother-in-law of Yvonne and Roberta and grandmother of Jacob, Jessica, Sarah and Jenny. A Funeral Service will be held in Roselawn Crematorium on Monday 12th November at 11.00am. 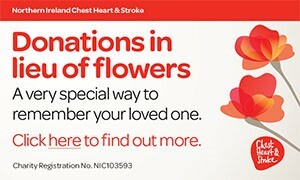 Family flowers only please, donations in lieu if desired to Chest, Heart & Stroke, 21 Dublin Road, Belfast, BT2 7HB. Deeply regretted by Anne, Todd and family. Deeply regretted by her friend Billy Crawford. Will be sadly missed by her family, Ian, Roberta, Jacob, Jenny and Louise. I am sorry to tell you that Mary (May) Campbell has passed away.